Students will get ready for exams via sorubankam.net website. Thanks to students of Izmir University of Economics, people preparing for exams will be able to do this anytime, anywhere they like with the help of online education site. 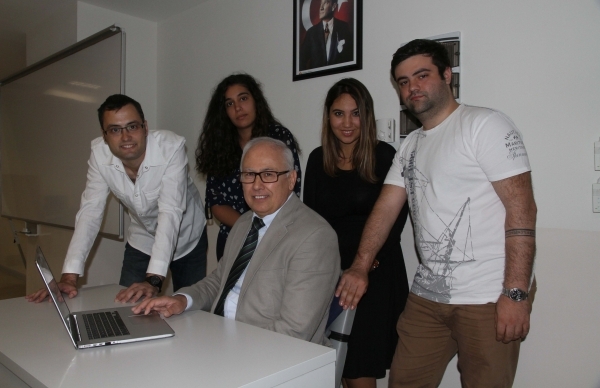 The project developed by Aykut Güner and Uğur Çekçi, students of IUE Software Engineering, and Başak Ünsal and Merve Çeşitli, students of Computer Engineering, under the guidance of Prof. Dr. Murat Aşkar, IUE Vice Rector, will allow teachers to upload their questions via mobile equipment and the students will be able to have access to them from wherever they want. Başak Ünsal, who gave information about their project, said that two separate subscription systems were developed for teachers and students. She said, “After receiving their accreditations, teachers upload questions and lectures on the site. When students log into the system, they will be able to study the subjects they desire. They will also be able to take tests.” Ünsal pointed out that Sorubankam.net internet site was developed in order to allow students to have access to learning resources anytime, anywhere. “We wanted students to have easy access to learning tools in this high tech competitive environment. Sorubankam.net works in three different platforms including web, android, and win8. Students are able to solve sound, video, or picture integrated tests, or study texts,” said Ünsal. Aykut Güner, on the other hand, stated that exams take up an important part of student life. Güner said that the students would be able to find all kinds of questions and answers on Sorubankam.net, ranging from TEOG (Transition from Elementary Education to Secondary Education Exam) to KPSS (Public Personnel Selection Examination).